You Are Here: Home » Korean Side Dishes (Banchan) » Ultimate Bibimbap Sauce, 4 Ways! Ultimate Bibimbap Sauce, 4 Ways! Ultimate bibimbap sauce recipe in four ways! 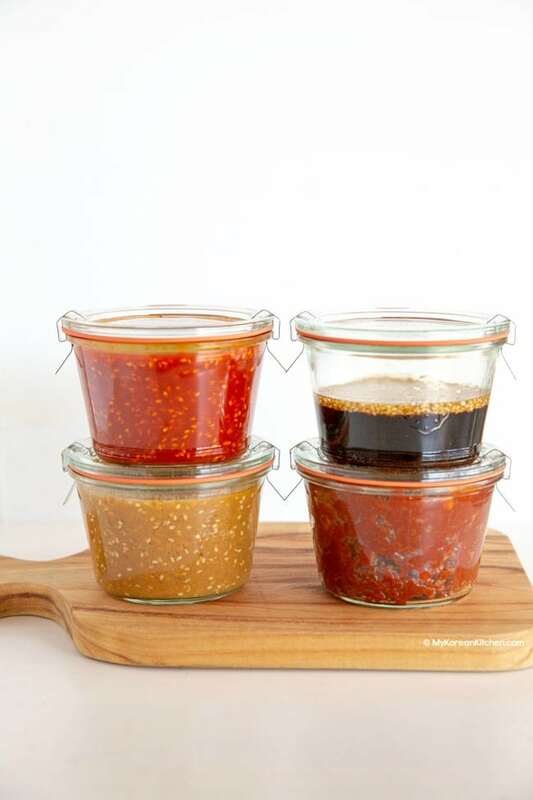 Here, you will find four styles of delicious Korean bibimbap sauce. It covers spicy to non-spicy bibimbap sauce and classic to funky flavor! 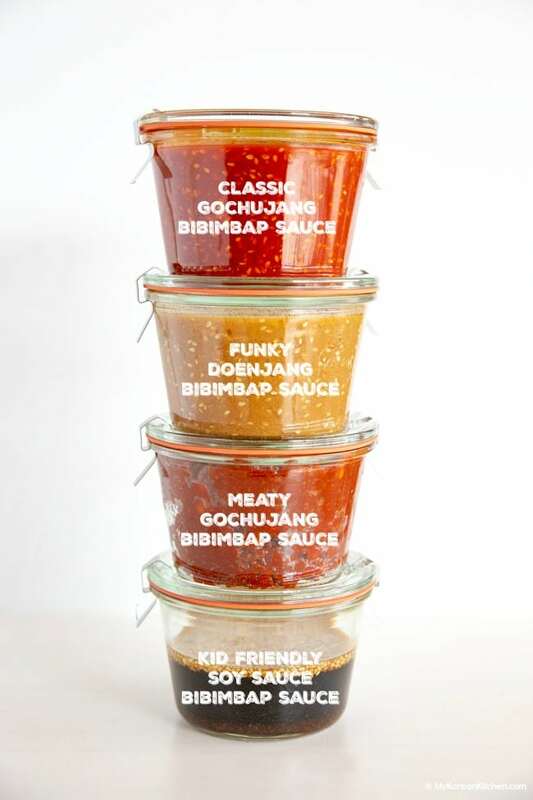 As each sauce has a unique flavor profile, you can choose one according to your preference and pair it with your favorite bibimbap ingredients! I’m pretty confident that you already know what bibimbap is, but in case you’re new to this dish, I will briefly explain it. Bibimbap is a bowl of steamed rice served with various vegetables (fresh or sautéed), some protein (red meat, chicken, tuna or tofu) and the sauce. To eat, you first mix all the ingredients with a spoon thoroughly. These are prepared with slightly different ingredients with slightly different techniques, so it’s worth reading about them! Now that I explained what bibimbap is, defining bibimbap sauce just got much easier. Bibimbap sauce is a sauce used in bibimbap before you mix everything. While each bibimbap ingredient plays a part in giving bibimbap flavor, I think the most important flavor note comes from the sauce. Commonly bibimbap sauce is made with spicy gochujang (Korean chili paste). Some people might call it Korean hot sauce for bibimbap or Korean red sauce for bibimbap because it looks red and is a tad spicy. 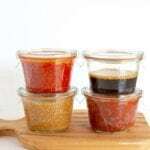 But as I briefly noted at the beginning, today I want to show you how to make 4 different styles of bibimbap sauce, including the classic one. These sauces all taste different and some go better with certain ingredients. Anyway, let’s continue. *Each of the sauces below are enough for 12 to 15 servings. **If you want to learn more about Korean ingredients, check my 30 essential Korean ingredients list. Some people make bibimbap with just plain gochujang, but that’s just a big NO for me. I love adding some extra flavor! This classic gochujang bibimbap sauce is slightly sweet, zingy and nutty. It’s hugely addictive! Many people around the world already tried and loved my “gochujang bibimbap sauce”. This recipe is a larger batch of my original bibimbap sauce recipe. This classic sauce goes well in any kind of bibimbap bowl. Just note that it’s a bit spicy! Combine all ingredients in a bowl and mix them well. I think this doenjang bibimbap sauce might be quite new to many of you. It’s certainly not a mainstream sauce, but nonetheless, it’s a great bibimbap sauce! Its key ingredient is doenjang (Korean soybean paste, also known as Korean miso paste). So you can expect some funky and slightly pungent flavor! I think this sauce goes well with vegetarian bibimbap where you use lots of vegetables and tofu. It’s also not spicy. This meaty gochujang bibimbap sauce is essentially stir fried gochujang with some ground meat. It’s a great condiment to have because it can really save your meal prep time. It is also a popular dipping sauce for ssambap (Korean rice lettuce wrap) as well. As a bibimbap sauce, this sauce is not as runny as the other sauces here. Also, this bibimbap sauce requires slightly more preparation than the rest of the sauces here, so I will refer you to check out my instructions from here – stir fried gochujang. I love my bibimbap so much, but until recently I didn’t make it as often as I would like. Because, my little girl can’t handle the spicy food well yet. Then I thought why not make a non-spicy bibimbap sauce for her!? I should have thought of it sooner. LOL. Anyway, this bibimbap sauce is without gochujang and is not spicy. It’s a great sauce for anyone who does not tolerate spicy food well. I based this sauce on my Korean pan fried tofu recipe. How handy! Make sure you only use a clean spoon when getting the sauce out. Stir the sauce well with a spoon prior to use. 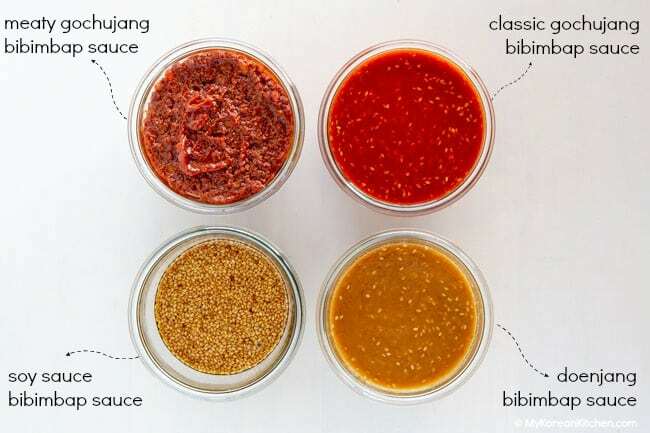 Make easy Korean bibimbap sauce in 4 different ways. Spicy to non-spicy and classic to funky flavors. I've got you covered for your bibimbap pleasure! Choose your choice of sauce. Combine all ingredients in a bowl and mix them well. For meaty gochujang bibimbap sauce, refer to this page for ingredients and instructions. For storage information, read through the post above. Hi, I'm Sue and I am the creator of My Korean Kitchen. Thank you for joining me in this delicious culinary journey! Copyright: Unless otherwise noted, all photography and content on this site is the intellectual property of Sue Pressey of My Korean Kitchen. Please do not copy and/or paste full recipes and images to any social media channels or websites without my prior written consent. This is strictly prohibited. You may however, use a single image and a summary of my article in your own words, provided that proper attribution is given to myself and an appropriate link back to my original recipe. Thank you. Disclosure: My Korean Kitchen is a participant in the Amazon Services LLC Associates Program, an affiliate advertising program designed to provide a means for sites to earn advertising fees by advertising and linking to Amazon.com. Thank you for the kid friendly version! I too have not been cooking bibimbap for a while since my 4yo niece eats with us. Now that I’ve found this, I can start making bibimbap again! This ja amazing!Thank you very much. It’s super delicious .I won’t order a bibimbap again. Homemade is the best! Interesting recipe. Korean Food lover will surely like this. Thumbs up to your bibimbap sauce.